Step by Step Nursery is located in Sandfield St, just off Maryhill Rd, near the junction with Queen Margaret Drive, and is registered for 70 children. We have 2 rooms for younger babies, offering a natural, heuristic and calming atmosphere for no more than 6 children, each session. The baby suite has three rooms, each specifically designed to meet the needs of a small group of children in a particular age range. Having such small groups allows us to foster excellent and meaningful relationships with families during their child’s first year with us. When they are up and walking, the fun really begins! Our third baby room is bright and spacious allowing for both quiet and more active and energetic play. The children play out of doors every day, either in our secure, all weather garden, in local parks or they go on local walks. They particularly enjoy visiting the ‘Happy Park’ and the Botanic Gardens. 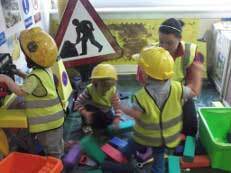 By working together, they developed ‘Learning Zones’ for the children, an approach to early years education that has been highly commended by many of our external partners including HMIe. Our staff in this room are dedicated to and passionate about children’s learning and most of them have gained additional qualifications. On-line learning journals provide parents with access to information and pictures about their child's time at nursery any time they want it. Our stay and play sessions are great fun for both new and existing parents, allowing a real insight into the day to day running of the nursery. Access to the all-weather outdoor play space is directly off this room, is used daily and provides more open ended learning opportunities. Many of this nursery’s successes are listed on the ‘Achievements’ page.